Albuquerque, NM- On June 23, 2016, the U.S. House of Representatives Select Investigative Panel issued a criminal referral to New Mexico Attorney General Hector Balderas with evidence that the University of New Mexico (UNM) and late term abortion facility Southwestern Women’s Options (SWO) may be in violation of local and federal law. Protest ABQ would like to thank the U.S. House Select Committee for their actions to hold the out of control and unregulated abortion cartel accountable in New Mexico. 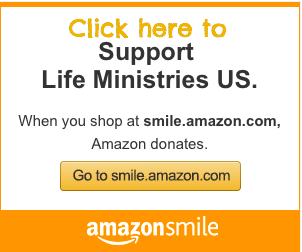 This has been an accumulation of the efforts of the collective pro-life community in New Mexico including New Mexico Alliance for Life as well as national pro-life groups such as, Operation Rescue. Protest ABQ is grateful that we have been able to contribute to this effort. This referral comes 11 months after Protest ABQ filed a formal complaint based on SWO’s 2012 and 2015 consent forms which exposed that donating fetal tissue was mandatory for all abortion patients. Documents obtained by the House Panel’s investigation reveal that in November 2015, shortly after Protest ABQ publicized that we had obtained their 2015 consent form, SWO updated the form to make fetal tissue donation optional (page 291). After finally obtaining numerous documents through subpoenas from the University of New Mexico and Southwestern Women’s Options, it was determined by the panel that 42 U.S.C. § 289g-2, a federal statute which forbids the transfer of fetal tissue for valuable consideration caused major concerns in light of a close symbiotic relationship between the two entities. In addition to the New Mexico statute cited in the Panel’s letter to Attorney General Balderas, Protest ABQ’s criminal complaint has asked the Attorney General to investigate whether UNM and SWO are in violation of New Mexico’s Maternal, Fetal and Infant Experimentation Act, NMSA § 24-9A-1, et seq. In a press release from Rep. Marsha Blackburn it was stated that, “Through its investigation, the Panel has discovered that personnel within UNM’s hospital and medical school have aggressively engaged in expanding abortion in New Mexico through the offices, personnel, and resources of UNM.” Highlighted activities by the panel include that UNM personnel, “expanded UNM”s role in training new abortion doctors” which has been ongoing since UNM’s involvement with the Ryan Residency Training Program. This program requires that residents practice performing abortions at various locations including Planned Parenthood and Southwestern Women’s Options, facts which the panel mentions in it’s plethora of findings. Members of Protest ABQ exposed this arrangement back in 2011. 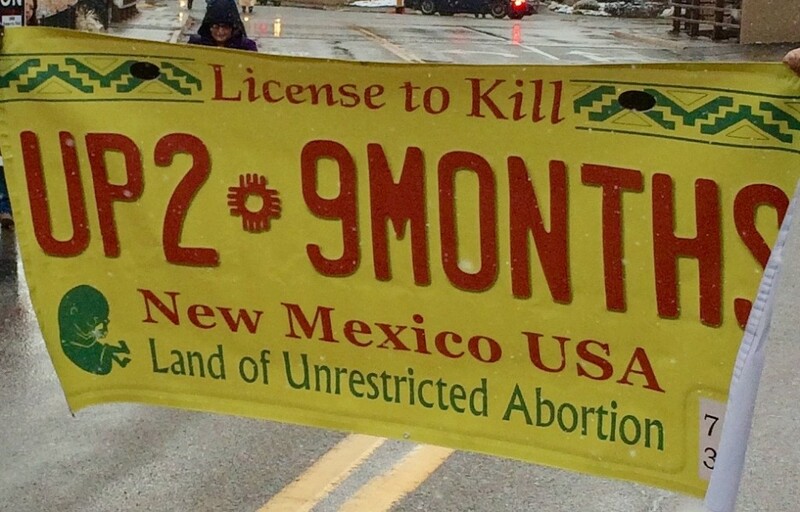 “Since 2011 members of Protest ABQ have worked to expose and connect the dots between Albuquerque abortion killing centers: University of New Mexico, Southwestern Women’s Options and Planned Parenthood. Findings have been submitted to the state’s highest authorities and investigations into unlawful and unethical conduct have been requested. The citizens of New Mexico have been concerned for many years about the use of state tax dollars that pay for abortions against their will and conscience. This fact should be a driving motivation for New Mexico’s Attorney General Balderas to conduct a thorough investigation into New Mexico’s abortion industry. Documents obtained from the Select House Panel’s investigation further reveal that since 2010 New Mexico tax dollars have paid over 5 million dollars to Late-Term abortion killing center, Southwestern Women’s Options! New Mexico Medicaid is directly funding the New Mexico Abortion Cartel. Protest ABQ is encouraging New Mexico Republican Governor, Susana Martinez, Lt. Governor John Sanchez, Albuquerque Republican Mayor Richard Berry along with all of the GOP leadership of New Mexico to urge New Mexico AG Hector Balderas to act upon the U.S. Republican House Committee’s criminal referral. Protest ABQ submitted its formal complaint to Balderas almost a year ago, and it appears that the U.S. Congress is backing us up! Protest ABQ looks forward to working with the New Mexico pro-life community until the abortion cartel in our state continues to be completely exposed and also fully dismantled. Albuquerque, NM- Protest ABQ has mailed postcards into the neighborhoods of New Mexico state legislators that were delivered to hundreds of homes this week. Sen. Michael Sanchez (D), Sen. Bill O’Neill (D) claim to be Catholic, yet they consistently defy their Catholic faith. O’Neill has voted against every pro-life bill that has come before him in the Senate Public Affairs Committee. Sanchez assigns senate bills to their committees, which has prevented pro-life bills from floor votes the past two years. Subsequently Sanchez has been championed by the likes of Planned Parenthood, the nations largest abortion provider. 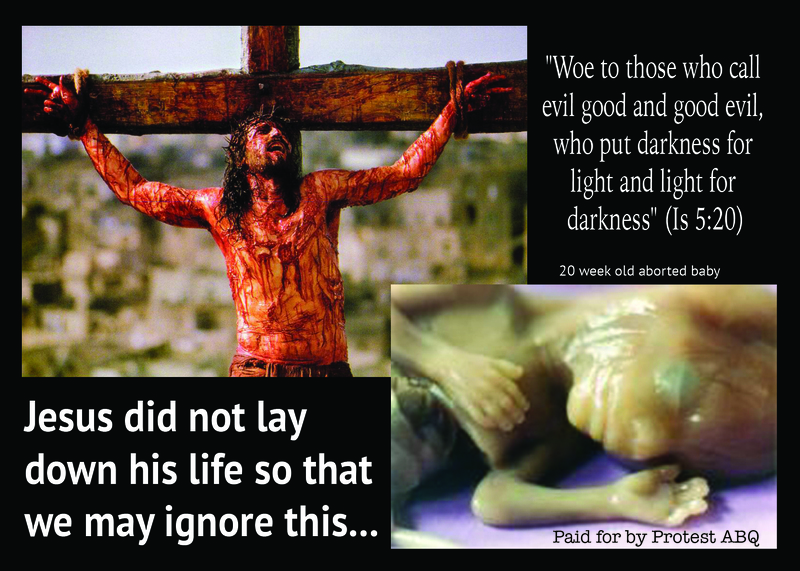 “Since we founded Protest ABQ, we have been dedicated to ending preborn child killing. We will continue to expose the truth about why New Mexico is the abortion capital of the Southwest. It is clear that the elected Democrats here in New Mexico, including many Catholics, support preborn childkilling and far too many Republicans, including some who call themselves prolife, condone preborn childkilling. Sen. Daniel Ivey-Soto (D) claims to be a member of the United Methodist Church, yet he has consistently voted against every pro-life bill that has come before him in the Senate Public Affairs Committee. Ivey-Soto also helped Albuquerque city councilor Pat Davis with GOTV efforts when Davis was running for office. The citizens of New Mexico deserve to know that their elected officials are “putting politics before Jesus and his babies and this is a form of idolatry!” stated Fr. Stephen Imbarrato, Priests for Life. Pre-born babies are murdered in the latest stages of pregnancy in our state and Jesus did not lay down His life so that we may ignore this reality that has so negatively impacted New Mexico. 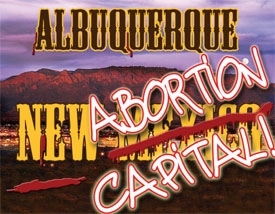 ABORTION CAPITAL…WHY ALBUQUERQUE, NEW MEXICO? New Mexico Governor Susana Martinez: What are you Doing About This? Albuquerque, Mayor Richard Berry: What are you Doing About This? Watch Below- 5 years of investigative research into New Mexico Reproductive Health Clinics.